Whatever you think about shows up all around you, so choose wisely what you think about. 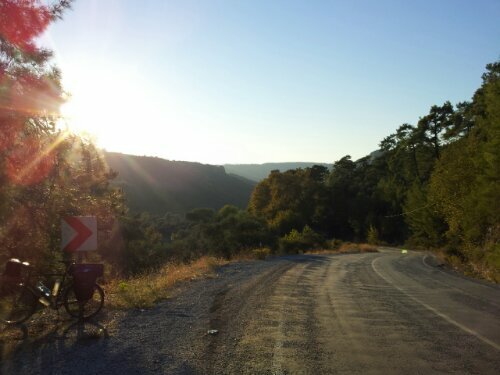 After leaving Şadiye and family in Korucu, the solitude of the ride through the countryside was broken by the hustle and bustle of Bergama. Sharpe on the ears and stimulating to the eyes, it emerged from the horizon without warning. Looking for shelter, I arrived at a campsite adjacent to the road and reluctantly accepted the cost in exchange for a pristine piece of grass and a warm shower. Little did I know how familiar I would become with said piece of grass over the following days, as torrential rain left me stranded for two extra nights, making a total of four, during which time I made some fantastic new friends in Mehmet and Neset. Mehmet the son of the campsite owner, and Neset, his brother in law, joined me one evening to talk about Mehmet’s imminent departure to make a new life for himself in Australia. They were great chaps, Neset may even be able to help bridge the Visa gap between Iran and I, fingers crossed. 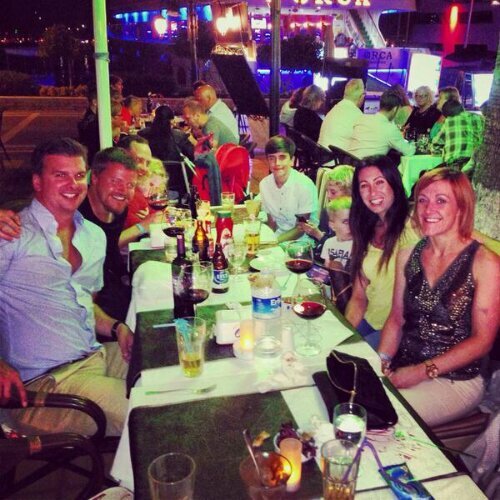 Mehmet – I wish you all the very best with your new life down under. Fortune favour’s the brave, so you’ll be just fine. 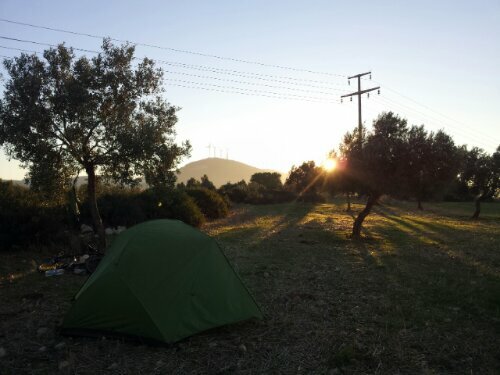 I finally left the sodden campsite with one thought on my mind; Marmaris. It would have been a nine hundred mile detour from my otherwise straight passage across Turkey, which on a bike is kind of a big deal. However, I love the Donovans, and the Kirbys, and who knows when I may see them again. It puts the lyrics ‘…and I would walk five hundred miles, and I would walk five hundred more…’ into perspective, particularly when you take into account the impressively rugged and hilly terrain (burning thighs). Izmer was, in a word, frantic. I arrived with a puncture, and after fixing it with super glue, I left with a puncture, and a knackered inner tube. In the process, the next morning, I managed to create a rather adventurous looking scene along the water front as I opted to dry my tent while fixing the puncture for a second time. A local cyclist helpfully stopped, so I could also fix his brakes for him; happy to be of service my good Sir. 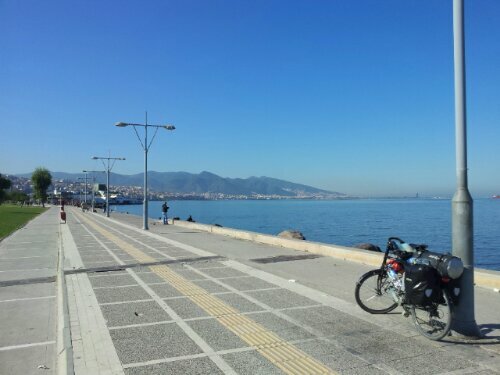 I eventually straddled a fully inflated Shurly, after restocking my spent inner tube at a local bike shop, and made my way toward Seferihisar (easy for you to say). 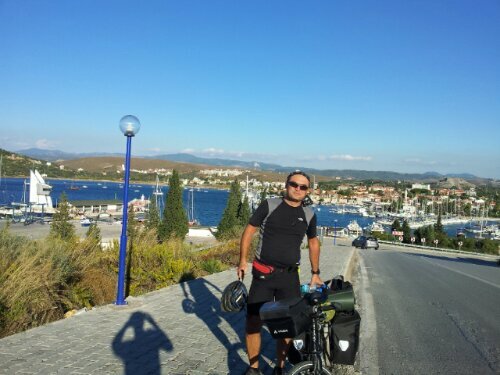 Along the way I met my first cycling touring buddy of the trip so far, Bhdr (pronounced Baha) who lives in Marmaris, and was on his way back there after a tour of the North. 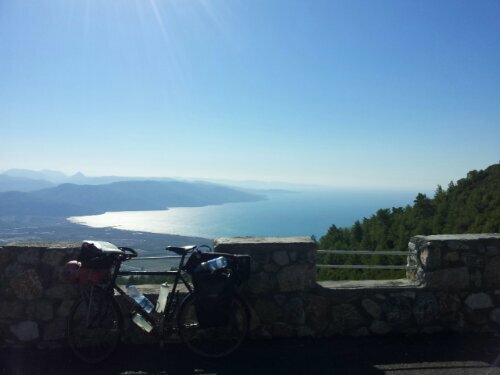 We were on different schedules, and the next day, after a very pleasant breakfast in Teos, I cycled on with a three day target to reach Marmaris and an unbelievably cheap studio apartment; £6 for five nights!! After sharing the hotel cost the night before with Bhdr, the following night I was back on the prowl for a spot in the wild, and after ninety three miles and almost all of my hope, I found it. It was a pretty brutal day; hot + hilly + wind against + nowhere to camp = big, sweaty miles and a tired, wee man. Still managed a one litre shower though – very refreshing. The next day just got tougher as I chose the scenic route over the smooth, fast, busy highway. 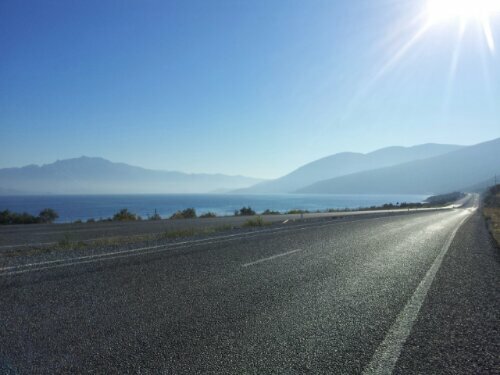 From just north of Teichiussa I cycled through Milas and South to Ören on the coast, then through the hills. Oh my goodness, the hills. 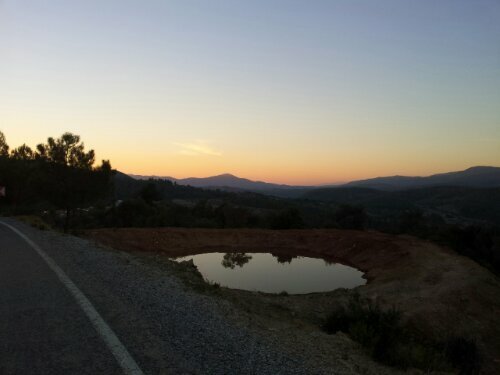 It’s fair to say I got lost in the hills. Not physically, of course, I didn’t know exactly where I was, or exactly where I was going (nothing new there), however, I did lose my way. Mountains have power within them. It’s difficult to explain, but when cycling up a mountain (or a big hill) you can sense how futile your efforts are against the might of an unforgiving mountain. With sheer drops everywhere and the flat potential camping spots covered by a blanket of bee hives, I cycled on and on, looking for somewhere to stop. 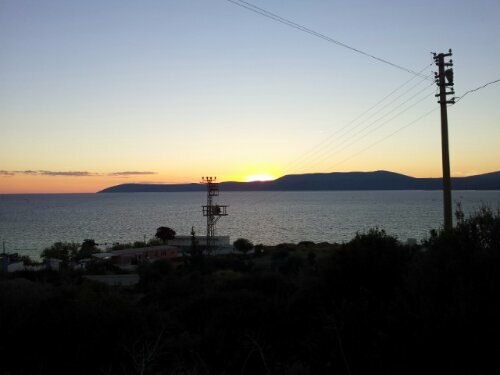 The bitter sweet reward of a fantastic sunset brings both joy and dismay through the eyes. A wonderful passing sight combined with the cold, harsh reality of darkness leaves you feeling happy, confused and lost. Now what? I have learnt there is always at least two options; cry distraughtly, travel through the emotional roller coaster of hitting the bottom and bouncing back to cycle on, or just cycle on. 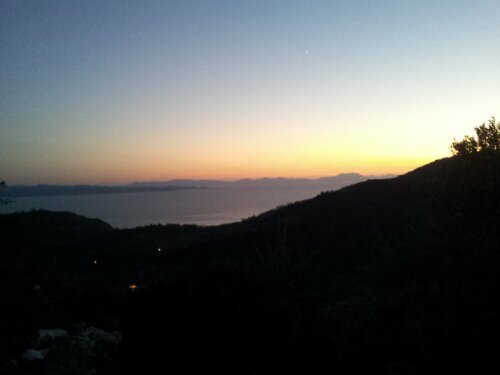 What I had never experienced was cycling on, up a mountain in the dark, until I was physically unable to cycle on. One side of the darkness helps to hide the reality of the relentless punishment by tarmac, the other provides a blank canvas for your mind to project all of your deepest fears on to (shiver). Whatever you are thinking about shows up all around you, the innate noises become those of vicious animals, and the shadows take their form and chill your bones. Whatever you think about shows up all around you, whether it’s dark or not. At the time, I was thinking a lot about how cold the air was as it passed my sweaty skin, and how tired and desparate I was to find somewhere to pitch my tent. Then, as I rounded another hairpin bend, I just happened to glance beyond the edge of the road to see what looked like a flat piece of grass. When I’m thirsty and out of water, I find a water fountain, hungry and I find food, in need of company and friendly faces arrive along my path. Time and time again the conents of my thoughts shows up just when I need it most. Carl Jung named this synchronicity; the experience of two events being meaningfully related. From my experience there is a connection between your thoughts and reality, and what an incredible connection it is. The next day shed new light on my circumstances, but didn’t change the reality of the further punishment by tarmac which lay ahead. I cycled on. 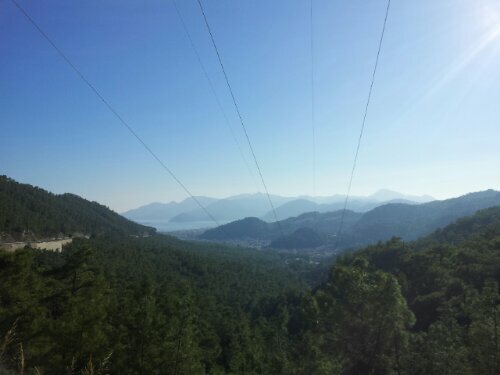 Those hills might have beaten me had it not been for my appointment at the lavish studio apartment in Marmaris and the rendezvous with the Donovans and the Kirbys. I can now confirm the apartment has walls, a roof, two beds, a kitchen, a bathroom and a balcony, there is no catch – amazeballs! And I found the Donovans and Kirbys just fine. The next phase of my journey is still yet to be determined, in the meantime, I hope to visit a friend of my Dad, Mel and his wife Carol who live on the Island of Rhodes. Jack & I cycled round Bute today – doesn’t even get on the Richter scale compared to what you are on! Good luck, following every post. Great to hear from you John and congratulations on your cycle round Bute!